This article was written in 1987 to mark the 75th anniversary of the publication of The Miners’ Next Step. It was intended to be the first part of a series of articles on the history of syndicalism in South Wales up to and including the formation of the CPGB. However, as no-one was interested in publishing it, no further articles were written. The opening years of the new century saw an increasing embitterment of industrial relations as productivity, which had always been low in South Wales due to difficult geological conditions, continued to decline with the exhaustion of the richer and more accessible seams. Constrained from raising prices by competition on the overseas markets where a high proportion of South Wales coal went for sale, the owners maintained their profits by cutting labour costs, with the main pressure falling on miners’ wages. For their part, the SWMF rank and file angrily resisted attempts to reduce their earnings, the purchasing power of which was already being eroded by a steep rise in the cost of living. How things had changed, a local paper commented in 1909, since the days when “it was accepted almost as an axiom that the interests of Capital arid Labour were identical. Today that statement would raise a laugh of derision”. If the ILP’s commitment to independent labour politics set it against Liberal nonconformity, however, the party leaders adapted other aspects of nonconformist ideology to their version of socialism, which they depicted as the outcome not of violent class conflict but of peaceful evolution towards social co-operation. This, together with the ILP’s concentration on parliamentary reform at the expense of providing leadership in industrial struggles, rendered the party increasingly irrelevant to the situation facing militants in the South Wales coal industry. An important section of the SWMF rank and file, particularly in the Rhondda, turned to Marxism as a source of theoretical orientation in their battles with the coalowners. Yet, although conditions in the coalfield made miners receptive to a Marxist analysis of the class struggle, no genuine revolutionary organisation had then been built in Britain. The self-styled Marxists of the Social Democratic Federation (SDF) had resigned from the embryonic Labour Party in 1901 after failing to secure the adoption of a socialist programme, while their own aim of electing a socialist majority to parliament to legislate the abolition of capitalism was scarcely less reformist than that of the ILP. Nor did the SDF bring a revolutionary strategy to the industrial struggle, for its leaders regarded strikes as at best a limited means of improving wages and conditions under capitalism and at worst a diversion from politics. One of those involved in the production of The Miners’ Next Step, W.H. Mainwaring, did join the SDF, becoming secretary of the branch which operated from the Marxian Club at Blaenclydach; but he later admitted that the SDF “cut no ice in South Wales because of its attitude to Trade Unionism. They remained in a wilderness”. When Marxist ideas were implanted in the Welsh coalfield it was not a political party that was responsible but the education movement based on the Plebs League and Central Labour College. The leading figure in this development was a Rhondda miner named Noah Ablett. During 1907-8 Ablett had attended Ruskin College, Oxford, where he and others among the young trade unionists who studied there rebelled against the class content of the education they received. Ablett recalled how they “found the specious lies of the professors in contrast to their workaday experiences; how impossible to them seemed the mutual understanding between employer and employee there advocated”. In the works of Karl Marx these students found a revolutionary answer to the bourgeois ideology propagated at Ruskin. Soon Ablett was holding unofficial classes in political economy, where he argued that the anti-Marxist Ruskin lecturers were “thrashing a dummy Marx” and encouraged his fellow students to study Capital at first hand. This was the role that Ablett himself played on his return to the Rhondda, where he was responsible for converting several ILP branches into de facto branches of the Plebs League, a South Wales wing of which was set up under his chairmanship in January 1909. And later that year when the Ruskin students, having called a strike against the sacking of the college principal who was sympathetic to their views, decided to secede and found the Central Labour College (CLC), Ablett campaigned throughout the Rhondda SWMF lodges to rally support for the new institution. The impact of his work can be illustrated by the case of Charlie Gibbons, who although a member of the SWMF had till then taken no real interest in the labour movement, concentrating instead on acquiring a technical education with a view to qualifying as a colliery official. But one evening in 1909, finding himself unoccupied after the unexpected cancellation of a mining class, he happened to attend a debate between Ablett and a leading supporter of Ruskin College. Gibbons was so impressed by Ablett’s arguments that he immediately abandoned his ambition to enter colliery management, joined the Plebs League and launched himself into a lifetime’s activity in the movement for independent working class education. As a result of Ablett’s efforts, by 1910 the Rhondda Plebs included, besides himself and his protégé Charlie Gibbons, such important individuals as W.F. Hay, W.H. Mainwaring, George Dolling, A.J. Cook and another former Ruskin rebel named Noah Rees. The rank and file organisation which would produce The Miners’ Next Step was thus already in the process of formation. In its educational activities the Plebs League did succeed in introducing workers to basic Marxist concepts that provided the elements of a scientific understanding of the class struggle. And in a British labour movement notorious for its aversion to theory this was no small achievement. Through the study of political economy workers were made aware of the process of capitalist exploitation, while in classes on “industrial history” it was revealed that capitalism was a historically transitory mode of production which must be replaced by socialism. But as an informal association of individuals the League lacked the democratic centralist organisation necessary to establish a creative relationship between theory and practice. In Rhondda Plebs classes Marxism was reduced to a set of general formulae on the nature of capitalism which gave poor political guidance to militants engaged in the intense class conflicts of the period. This essentially propagandist version of Marxism was identified with a mechanistic distortion of historical materialism. “Political ideas”, as Ablett put it, “being a super-structure arising out of the economic conditions of society, must lag behind the actual facts. In South Wales conditions were forcing trade unionists to believe that only revolutionary socialism was possible.” All that was required of Marxists, according to this view, was to accelerate the workers’ spontaneous response to changes in “economic conditions”, for which task a loose propaganda body like the Plebs League was considered quite adequate. Political leadership was renounced in favour of what was, so far as practical agitation was concerned, really no more than a more militant and better organised version of orthodox trade unionism. Central to the industrial policy of the Rhondda Plebs was the theory of industrial unionism, which sought to overcome the sectional weaknesses of the trade unions by building in each industry a single powerful union covering all the workers employed in that industry. This, it was argued, would make possible a more effective struggle against an increasingly organised capitalist class and, furthermore, lay the basis for the eventual control of the means of production by the workers. The appeal of industrial unionism to Ablett and his comrades is understandable, for it offered not only a means of fighting the large coal companies of the M&SWCA over wages and conditions but also a long term revolutionary strategy which, from the standpoint of these rank and file militants, must have seemed to present a more direct route to socialism than did parliamentary reformism..
Industrial unionist ideas had been introduced into the British labour movement by a small revolutionary group called the Socialist Labour Party (SLP), with whom Ablett had made contact while at Oxford. But the SLP’s attempts to build entirely new revolutionary unions on the model of the Industrial Workers of the World (IWW) in the United States proved impossibly sectarian in Britain. Although many of the Rhondda Plebs continued to describe themselves as industrial unionists, they were influenced primarily by the industrial strategy that the veteran socialist and trade unionist Tom Mann began popularising on his return from Australasia in 1910. Drawing on the ideas of French syndicalism with its commitment to the insurrectionary general strike as well as on those of the IWW, Mann argued that under British conditions industrial unions could best be formed through the reconstruction of the existing trade unions. By adopting a fighting policy based on “direct action” by the rank and file, the refusal to enter into long agreements with the employers and the exercise of industrial solidarity in the form of sympathy strikes, the union movement could become “what it ought to be – the real class conscious machinery for the overthrow of Capitalism and the realisation of Socialism”. Although Mann did not as yet reject political action, the syndicalist programme was to be carried out under the direction not of a political party but of the Industrial Syndicalist Education League (ISEL), a loose federation of propagandist groups which aimed to raise the consciousness of the rank and file. This was a conception of revolutionary organisation which would influence the thinking of syndicalist militants for years to come. It also dovetailed neatly with the methods of the Plebs League, the Rhondda branches of which functioned initially as the main vehicle for syndicalist propaganda in the area. By September 1910, Mann’s journal the Industrial Syndicalist could list the names of several Rhondda Plebs – Ablett, Hay, Doliing and Mainwaring – as advocates of syndicalist principles, and in November Ablett attended the ISEL conference at Manchester as a South Wales miners’ delegate. In the autumn of 1910 the South Wales syndicalists found fertile round for the propagation of their ideas in the industrial upsurge which centred on the bitter conflict at the Cambrian Combine. This dispute revolved around the prevalent problem of “abnormal places”, where working conditions made it impossible for a hewer on a piece-rate to earn a living ware. As part of the drive to reduce labour costs managernent cut back on the customary allowances made in such circumstances. When a new seam subject to abnormal conditions was opened at one of the Cambrian pits, the miners had therefore demanded a rate high enough to guarantee them adequate earnings, and the company had responded by locking them out. Eventually the whole of the Cambrian Combine downed tools in support. With further disputes in other parts of the coalfield, some 30,000 miners were on strike in South Wales in November 1910. They found themselves confronted by such massive detachments of police and troops, sent there on the orders of Liberal home secretary Winston Churchill, that the Rhondda in particular took on the character of an occupied territory. Although Tom Mann was present in the Rhondda during the “sack of Tonypandy”, and both Will Mainwaring and Noah Rees were prominent on the Cambrian Combine Committee, the rank and file body which ran the strike, no syndicalist influence can be detected in the rioting. In fact socialists of all shades were unanimous in opposing such methods. Yet it would be a mistake to dismiss the riot as an act of blind destruction. The shopkeepers whose stores were ransacked were bastions of the local business community, and it is clear that the looting represented in a confused way a revolt against the rights of bourgeois property which had been so brutally defended by the police at the Glamorgan Colliery. It was not accidental that private homes were left unscathed nor that the first shop to be attacked was owned by Rhondda’s senior magistrate. The riot glaringly revealed that the ideology of class harmony preached by the chapel no longer held sway over the Rhondda working class. As one historian has argued, Tonypandy “should be seen as evidence of social fracture as much as of industrial dispute”. When industrial action proved unavoidable, Mabon and his colleagues used their influence to secure a vote from the membership rejecting a coalfield stoppage in favour of a financial levy in support of a sectional strike at the Cambrian Combine, and they hurriedly arranged a return to work by strikers elsewhere in the coalfield in order to leave the Cambrian dispute isolated. The MFGB leadership took a similar line, giving financial support of £5,000 per week during the first months of the strike but resisting the demand, raised by the South Wales militants after the state forces had frustrated attempts to close down the Cambrian collieries, for escalation of the conflict into national action for a guaranteed minimum wage. The union bureaucracy eventually succeeded in forcing the men back to work in September 1911 on terms which were no better than those offered by managernent at the beginning of the strike. But the matter did not end there. A meeting of SWMF dissidents held at Cardiff in May had taken up the question of “forming a group in the coalfield for the furtherance of a militant policy”. And in August at Tonypandy a meeting of the Unofficial Reforrn Committee (URC), as it became known, resolved to draw up a programme for the reform of the SWMF. A draft of the programme having been prepared by Noah Ablett, George Dolling and Noah Rees, with assistance from others such as Will Mainwaring and Charlie Gibbons, this was circulated round the lodges; and after suggested amendments had been incorporated the finished text was sent to the printers in November. The Miners’ Next Step was published in Tonypandy in February 1912. It save clear evidence of the influence of syndicalist and industrial unionist ideas on the lessons which SWMF militants had drawn from the Cambrian Combine strike. 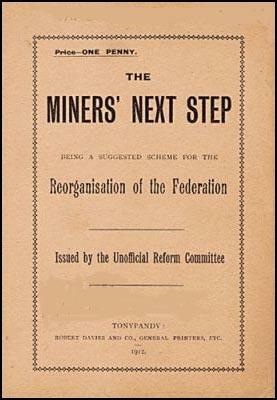 The Miners’ Next Step outlined a plan for the reorganisation of the SWMF (and eventually the MFGB) as an industrial union based on the principle that “The old policy of identity of interest between employers and ourselves be abolished, and a new policy of open hostility be installed”. In contrast to the federal structure of the SWMF, this new union would be a centralised organisation “constructed on fighting lines, allowing for a rapid and simultaneous stoppage of wheels throughout the mining industry”. Although the ultimate aim of the organisation was to “take over the mining industry and carry it on in the interest of the workers”, the pamphlet began rather more mundanely with an evaluation of the SWMF leadership’s conciliation policy from the standpoint of “its usefulness as a wage getting policy, for that is the best and the only real test of any policy”. In this respect the existing policy, with its acceptance of long compromise agreements, was condemned as a disaster. Most significantly, the pamphlet’s opposition to the labour bureaucracy was extended into a rejection of leadership as such. “The possession of power inevitably leads to corruption”, it was asserted. “All leaders become corrupt, in spite of their own good intentions.” The pamphlet insisted, therefore, that “the remedy is not new leaders” but rather an increase in the powers of the membership. With supreme control vested in the lodges and the executive transformed into a rank and file body from which officials were excluded, the workmen would become the “bosses” and the “leaders” their servants. And although over the following years URC supporters would apply these “no leader” proposals very erratically, there always remained a consistent rejection of the struggle for political leadership in favour of a reliance on rank and file spontaneity. The Miners’ Next Step, it should be noted, did not rule out political action, but this was presented in exclusively parliamentary terms. The various Acts of Parliament affecting the interests of labour, the pamphlet argued, “demand the presence in Parliament of men who directly represent, and are amenable to, the wishes and instructions of the workmen. While the eagerness of Governments to become a bludgeoning bully on behalf of the employers could be somewhat restrained by the presence of men who were prepared to act in a courageous fashion”. But the real battle with the capitalist class was to be fought at the point of production and the socialist revolution itself would be carried out by exclusively industrial means. Supporting the demand for a minimum wage and a 7-hour day, The Miners’ Next Step proposed that “a continual agitation be carried on in favour of increasing the minimum wage and shortening the hours of work until we have extracted the whole of the employers’ profits”. The point at which this strategy would lead to the “elimination of the employer” was left vague; it was at any rate dependent on the progress of industrial unionism in other industries. Once the workers, organised in their industrial unions, had gained control of their respective industries production would be co-ordinated by a Central Production Board, with the details of the immediate process of production to be left in the hands of the workmen themselves. Nationalisation of the mines was forcefully rejected. State ownership, it was argued, would change only the form of capitalist exploitation. In the introduction to a 1972 Pluto Press reprint of The Miners’ Next Step this is applauded as an attempt “to instill immediate demands with an explicitly revolutionary content”. In reality, however, the syndicalists of the URC reduced revolutionary strategy to a mere escalation of basic demands for improved union organisation, higher wages and shorter hours. Where the events surrounding the Cambrian Combine strike had posed the question of uniting the working class community around a political programme, The Miners’ Next Step restricted the class struggle to militant trade unionists. Moreover, revolutionary socialism requires a strategy for smashing the bourgeois state apparatus and replacing it with the dictatorship of the proletariat as the first step in the transition to a socialist society. Yet the URC offered no perspective for the seizure of state power. Despite the revolutionary intentions of its authors, we must conclude, The Miners’ Next Step failed to outline an effective programme for the overthrow of capitalism. Indeed, it is not by obscuring their weaknesses but by recognising and learning from their mistakes that we pay tribute to the young miners who evolved this syndicalist programme. At the same time it should be emphasised that The Miners’ Next Step was the product of a genuine struggle to find a revolutionary road to socialism. The South Wales syndicalists’ hatred of capitalism and of the labour bureaucracy that helped to sustain it was later harnessed by the Communist Party of Great Britain, which established its base in the coalfield among the militants trained in the traditions of the URC. This, and other important developments in the unofficial movement which took place after the publication of The Miners’ Next Step, will be the subject of further articles in this series.